An aerial view of One World Trade Center in Lower Manhattan in New York City, Sept. 8, 2016, is pictured. The push to reform New York City’s property tax system is a zero sum game that has various types of home owners, developers, investors, and even renters jostling with each other for a leg up. The commission formed to update the city’s complicated tax structure for the first time in more than 20 years is instructed to make any proposals “revenue neutral.” That means tax cuts for one group have to be balanced with increases for another group—places in Staten Island pitted against Manhattan; condo owners versus investors; even a state assemblymember against Mayor Bill de Blasio over whose cuts get offset with increases. The revenue restriction is meant to ensure that the city doesn’t suddenly find itself on the short end of a plummeting tax stream. Property taxes account for an estimated $26.4 billion in the current fiscal year, or 45 percent of total city revenue. But the requirement also creates an “every owner for himself” situation that’s likely to ratchet up political and legal debates and slow any proposals to level the playing field. Competing owners and interest groups have been taking their cases to the advisory commission. Kara Kelly, who’s family has owned a ten-unit apartment building on Manhattan’s Upper West Side for some 75 years, told the commission at a hearing last year that new buyers snatching up buildings and converting them to luxury living spaces have driven up her property taxes and put her business at risk. She also said she can only pass on a limited amount of the cost to renters in units covered by the city’s rent stabilization program. 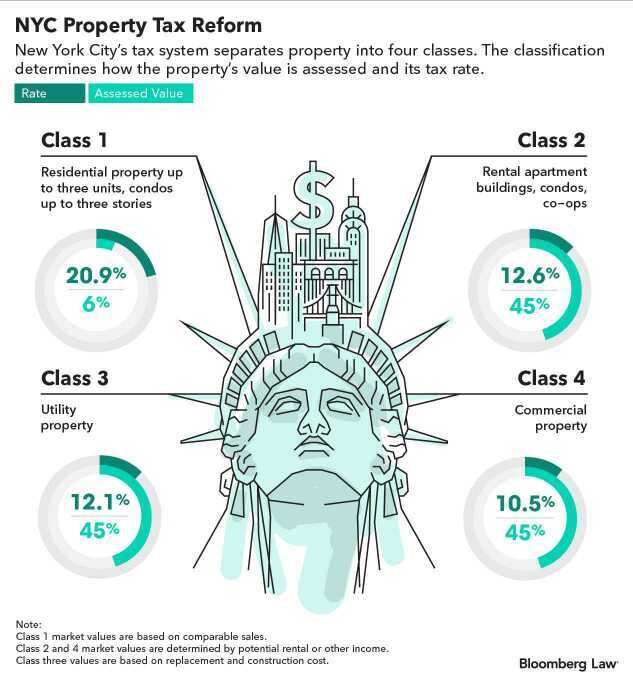 New York City property owners are divided into four classifications, pitting those classes against each other as natural rivals in the reform process. Condominium and cooperative housing owners (lumped with large residential properties in Class 2), for instance, often complain that a larger share of their property value is taxed than is for single-family and small home owners (Class 1). Others point out that condo and co-op rates are based on rental income values, which are typically lower than the sale values used to calculate taxes for other residential properties. The system has also generated significant differences in tax bills within classes, as a maze of caps and exemptions limit increases and favor owners in neighborhoods where property values are surging. That has owners in places like Staten Island and the Bronx complaining that their effective tax rates are a much larger percentage of their property’s value than for homes and commercial space in Manhattan and Brooklyn that could fetch a bigger price tag on the open market. The city advisory commission, formed last year by de Blasio (D) and City Council Speaker Corey Johnson (D), has held a series of public hearings so far as it works on drafting a set of recommendations. One trigger for the commission’s creation was a lawsuit alleging that the current property tax rates and assessments scheme discriminates against owners in minority-heavy neighborhoods. The court battle highlights some of the competing interests at play. A group called Tax Equity Now NY (TENNY) is focusing its lawsuit largely on the negative impact of high property taxes on single-family home owners and renters. But the organization also represents investors, developers, and residential and commercial property owners most likely to benefit from any reduction. TENNY’s members include some of the city’s largest property owners, like the Durst Organization, RXR Realty, the Related Companies LP, Two Trees, and Silverstein Properties Inc. Civil rights groups like the National Association for the Advancement of Colored People, the Black Institute, and LatinoJustice are also involved in the organization. Large residential rental (Class 2) and commercial (Class 4) property owners say they’ve been left holding a disproportionate share of the tax bill. Those properties are taxed at 45 percent of a property’s market value, while single-family homes and residences with two or three units are assessed at 6 percent of their value. Class 4 owners currently pay more than 42 percent of the city’s entire property tax levy, despite representing a little more than a quarter of the total property market value, according to the finance department. Class 2 owners represent another quarter of market value and pay about 37 percent of the citywide levy. Class 1 property owners, which account for more than 46 percent of the market value, pay 15 percent of the citywide levy. Class 2 owners, utility companies, represent 3 percent of the market value and pay 6 percent of the levy. The Real Estate Board of New York, a formidable industry trade association, wants the city to alleviate the tax burden on income-producing properties. “A fair real property tax system requires not only an equitable distribution of the levy but an equitable burden based on value and ability to pay,” Michael Slattery, REBNY’s senior vice president told the advisory commission at an October 2018 hearing. The commission, led by former city housing chief Vicki Been and Marc Shaw, a deputy mayor in Michael Bloomberg’s administration, also has to consider disparities within the property classes. Lags in assessments and caps on how much rates can be increased—6 percent a year and 20 percent over five years; 8 percent a year and 30 percent over five years for condos and co-ops with 10 units or fewer—have made where the property is located perhaps more important than what it’s worth for tax purposes. Even when a Class 1 property is sold, that might not have much impact on its tax assessment. Caps remain intact and values are based on comparable sales in the area, including but not limited to the sale of the property itself. Critics of the system often point to De Blasio’s property tax bill as an example of the disparity. The mayor and his wife last year paid a total of $7,000 for two homes in the Park Slope neighborhood of Brooklyn reportedly worth more than $3 million combined. That’s less per home than what many Staten Island residents say they pay for property worth a fraction of the market price. For instance, State Assemblymember Nicole Malliotakis (R) last year paid nearly $5,500 in property taxes on her single-family home in the Great Kills section of Staten Island. The property was assessed at a value of roughly $560,000, according to staff for Malliotakis, a frequent critic of the tax structure. “Low- and middle-income neighborhoods are subsidizing the property taxes of homeowners in more affluent and expensive neighborhoods in our city, and that is wrong” Malliotakis told the commission at a hearing on Staten Island. A spokesman for De Blasio didn’t return a request for comment this week. Carol O’Cleireacain, an economic consultant and advisory commission member, said at a recent hearing that the panel is being asked to “completely change a system that was put in 40 years ago for a different economy and a different set of housing.” Because tinkering with one area of the system will necessarily impact others, the stakes are high. “Do you know how much damage we could do if we break it?” O’Cleireacain asked witnesses at the hearing. —With assistance from John Herzfeld in New York.